In actual fact, niobium, like all other metals, is gray. However, by applying a passifying oxide layer, we allow our metal to gleam in a beautiful array of colors. But niobium is not just pretty to look at. Like tantalum, it is resistant against many chemicals and can be easily formed even at low temperatures. Niobium is special because this high level of resistance is achieved at a relatively low weight. We use this material to manufacture coin inserts of all colors, corrosion-resistant evaporation boats for use in coating technology, and dimensionally stable crucibles for diamond growth. Thanks to its high level of biocompatibility, niobium is also used as a material for implants. 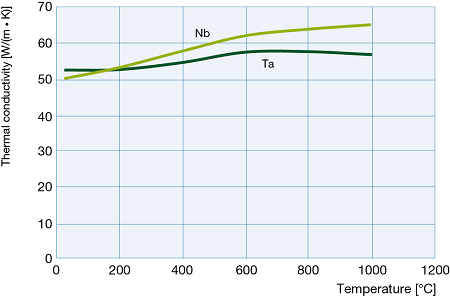 Thanks to its high transition temperature, niobium is the perfect material for superconducting cables and magnets. You can rely on our quality. We use only the purest niobium as our input material. This ensures that you benefit from a very high level of material purity. Of coins and diamonds. Applications for niobium. When used in coin production, our niobium can be seen in its very best light. An anodizing process forms a thin oxide layer on the niobium core. The refraction of the incident light causes the layer to shine in a range of different colors. We can influence these colors by modifying the thickness of the layer. From red to blue: Any color is possible. Its high level of resistance and excellent formability make niobium the perfect material for the crucibles used to manufacture synthetic polycrystalline diamonds (PCD). Our niobium crucibles are used for the high-pressure, high-temperature synthesis. A good all-rounder: Material properties of niobium. Niobium belongs to the group of refractory metals. Refractory metals are metals that have a higher melting point than platinum (1 772 °C). In refractory metals, the energy binding the individual atoms together is particularly high. Refractory metals have a high melting point coupled with a low vapor pressure, high modulus of elasticity and high thermal stability. Refractory metals are also characterized by a low coefficient of thermal expansion. Compared to other refractory metals, niobium has a relatively low density of only 8.6 g/cm3. Niobium is located in the same period as molybdenum in the periodic table. Its density and melting point are therefore comparable to those of molybdenum. In the same way as tantalum, niobium is prone to hydrogen embrittlement. The heat treatment of niobium therefore takes place in a high vacuum and not in a hydrogen atmosphere. Both niobium and tantalum also offer a high level of resistance against all acids and good formability. Like all refractory metals, niobium has a high melting point and a relatively high density. 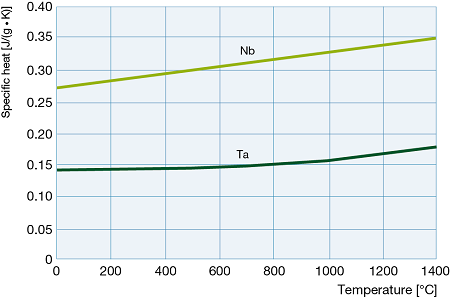 The thermal conductivity of niobium is in the same range as that of tantalum but is lower than that of tungsten. The coefficient of thermal expansion of niobium is higher than that of tungsten but is nevertheless far below that of iron or aluminum. The mechanical properties of niobium depend primarily on its purity and in particular its oxygen, nitrogen, hydrogen and carbon content. Even small concentrations of these elements can have a very significant effect. The manufacturing process, the level of deformation and the heat treatment are other factors that modify the material properties of niobium. Like almost all the refractory metals, niobium possesses a body-centered cubic lattice. 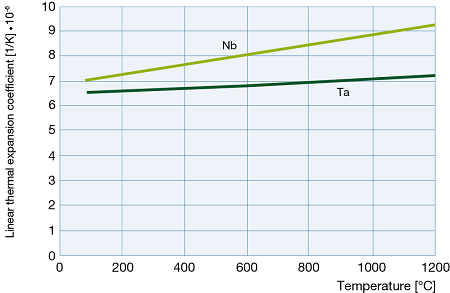 The brittle-to-ductile transition temperature of niobium lies below room temperature. Niobium is therefore very easy to form. At room temperature, niobium has a breaking elongation of more than 20 %. While it becomes stronger and harder with increasing deformation, this simultaneously causes the material's breaking elongation to fall. Although the material loses ductility, it does not become brittle. 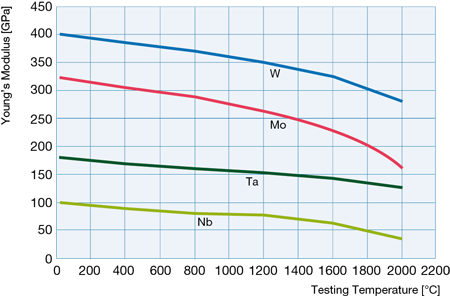 At 104 GPa at room temperature, the modulus of elasticity of niobium is less than that of tungsten, molybdenum or tantalum. The modulus of elasticity falls with increasing temperature. At around 1 800 °C, the value is 50 GPa. Thanks to its high level of ductility, niobium is very suitable for forming processes such as bending, stamping, pressing or deep-drawing. To prevent cold welding, it is preferable to use steel or hard metal tools. It is very difficult to use cutting processes with niobium. The chips do not break cleanly. We therefore recommend using tools equipped with chip formers. Niobium offers excellent weldability compared to tungsten and molybdenum. Do you have any questions about the mechanical processing of refractory metals? We would be delighted to help you with our many years of experience. Niobium is naturally covered by a dense oxide layer. This oxide layer protects the material and gives niobium a very high level of corrosion resistance. At room temperature, there are very few inorganic substances against which niobium is not resistant: concentrated sulfuric acid, fluorine, hydrogen fluoride, hydrofluoric acid and oxalic acid. Niobium is resistant to aqueous ammonia solutions. Alkaline solutions, molten sodium hydroxide and potassium hydroxide attack niobium. Interstitially dissolved elements, and hydrogen in particular, can also cause niobium to become brittle. The corrosion resistance of niobium falls with increasing temperature and in contact with solutions consisting of a variety of chemicals. At room temperature, niobium is completely resistant to all non-metallic substances with the exception of fluorine. However, at temperatures above approximately 150 °C, niobium reacts with chlorine, bromine, iodine, sulfur and phosphorous. Niobium is resistant to a series of metal melts such as Ag, Bi, Cd, Cs, Cu, Ga, Hg, K, Li, Mg, Na and Pb provided that these melts have a low oxygen content. Al, Fe, Be, Ni, Co as well as Zn and Sn all affect niobium. Niobium does not react with noble gases. Pure noble gases can therefore be used as protective gases. However, with increasing temperature, niobium reacts strongly with airborne oxygen, nitrogen and hydrogen. Oxygen and nitrogen can be removed again by annealing the material in a high vacuum at temperatures above 1 700 °C. Hydrogen is removed at lower temperatures of approximately 800 °C. The process results in a loss of material due to volatile oxides and the recrystallization of the structure. Do you want to use niobium in your furnace? Please note that niobium may react with construction parts made from refractory oxides or graphite. Even very stable oxides such as aluminum, magnesium or zirconium oxide may be reduced at high temperatures when in contact with niobium. Contact with graphite can result in the formation of carbides which cause the embrittlement of niobium. Although niobium can usually be combined without problems with molybdenum or tungsten, it may react with hexagonal boron nitride and silicon nitride. The limit temperatures listed in the table below apply in a vacuum. If you use a protective gas, the values are between 100 °C and 200 °C lower. It is possible to regenerate niobium that has become brittle due to the presence of hydrogen by means of high-vacuum annealing at 800 °C. In 1801, the English chemist Charles Hatchett examined a heavy black stone that had come from America. He found that it contained a hitherto unknown element which he named Columbium in honor of its country of origin. The name that is most commonly given to it – niobium – goes back to the year 1844 and comes from a second discoverer Heinrich Rose. Heinrich Rose was the first person to separate niobium and tantalum. In the past, it was not possible to distinguish between the two materials. Rose named niobium after Niobe, the daughter of King Tantalus. In doing so, he wanted to stress the close relationship between the two metals. Metallic niobium was manufactured for the very first time using a reduction method by C. W. Blomstrand in 1864. Niobium did not receive its official name until some 100 years later after a long period of dispute. The International Union of Pure and Applied Chemistry adopted the name "niobium" as the official designation. Niobium occurs naturally most frequently in the form of columbite ore, which is also known as niobite and has the chemical formula (Fe,Mn) [(Nb,Ta)O3]2. Another important source of niobium is pyrochlore, a calcium niobate with a complex structure. Deposits of this ore can be found in Australia, Brazil and some African countries. The mined ores are refined over a number of different steps to obtain concentrates of up to 70 % (Ta,Nb)2O5. These are then dissolved in hydrofluoric and sulfuric acid. The tantalum and niobium fluoride compounds are then separated using an extraction process. The niobium fluoride is oxidized with oxygen to form niobium pentoxide before being reduced with carbon at 2 000 °C to produce metallic niobium. Ultra-pure niobium is then obtained by applying an additional electron beam remelting process.